Some of the 19 dogs rescued from a local trader by Humane Society International prior to the Yulin dog meat festival. The annual dog meat festival face growing opposition at home and abroad. The annual festival that sees the slaughtering and consumption of tens of thousands of dogs has just begun in the southwestern Chinese province of Guangxi. The Lychee and Dog Meat Festival, more commonly known in the west as the Yulin Dog Meat Festival, is an annual event that coincides with the summer solstice. Dogs have been consumed in many parts of East and Southeast Asia for centuries, as some believe the eating of dog meat alleviates the summer heat. However, the Yulin Dog Meat Festival is a relatively young event, having only started in the past decade after being organized by local businesses. Other than the obvious cultural uniqueness of consuming dog meat, the festival has been criticized for the cruel ways dogs are slaughtered — often beaten to death. Organizers have said that dogs are treated humanely. In spite of this, photographic evidence suggests that dogs are often kept in tight cages and left outside in the heat of summer with no access to water. In spite of this, the festival is still a source of pride for many locals of Yulin, an event that people, and dogs, travel to from all across China. In recent years however, it has garnered indignation and protests from all parts of the world. A number of Hollywood Stars including Joaquin Phoenix, Rooney Mara, and Matt Damon have given their support to the cause, calling for an end to the festival in a video by Animal Hope & Wellness Foundation. British celebrities Ricky Gervais and Leona Lewis have also condemned the festival. U.S. 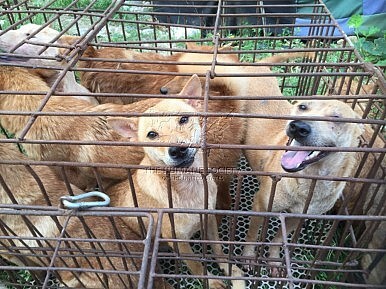 Senator Alcee L. Hastings has introduced a resolution condemning China’s Yulin Dog Meat Festival. “During the Yulin Dog Meat Festival, 10,000 stray dogs and stolen pets are captured, caged, and slaughtered. This extreme spectacle of animal cruelty is both inhumane and a threat to public health in Yulin. The United States cannot stay silent,” Hastings told Congress on May 25. It appears the negative publicity the festival has been receiving is having an effect. During a regular press conference on Tuesday, China’s Foreign Ministry spokesperson Hua Chunying clarified that the Yulin government has never supported or organized the festival. In fact, Yulin authorities set up checkpoints along roads leading to Yulin in an effort to stop incoming trucks filled with dogs for the festival. Under China’s “one certificate per dog” rules, all trucks shipping live dogs and cats across provincial boundaries are supposed to have an individual health certificate for each animal, according to Humane Society International. A recent poll commissioned by local animal welfare groups shows that a majority of people (64 percent) want a permanent end to the festival. It also showed 51.7 percent of the respondents wanted the dog meat trade banned completely, while 69.5 percent claimed to have never eaten dog meat, according to Xinhua. Humane Society International estimates 30 million dogs a year are killed across Asia for human consumption; approximately 10-20 million are killed in China alone, and up to 15,000 die just for the Yulin festival. In addition to animal rights concerns, the World Health Organization warns that the dog trade spreads rabies and increases the risk of cholera 20-fold. Further reflections on animal welfare in China, and the role globalization plays.